Well shipmates, here is the latest edition of "The Stoddert" newsletter. The first reunion is now history. I think that everyone who attended would agree that the reunion was a success. What a great time, that just about says it all. For the statisticians in the group, our attendance in Saint Louis included more than 80 Shipmates plus their guests with a total of more than 130 at the Banquet Dinner. Herm, Carmen and I arrived at the hotel early so that we could get things started. First off, we had to locate several boxes of cups from K&E Crafts that had been shipped to the hotel earlier. Several people had already arrived and while we had lots to do, we took time out to greet our shipmates. Unfortunately, I had to excuse myself and start taking care of business. Once the car was unloaded and things were moved into the room, we headed out to the store to pick up hospitality room snacks and drinks. Several carts full of chips, pretzels, cheese curls and other snacks as well as a dozen or so cases of soft drinks later, we headed back to the hotel for our first meeting with the hotel staff. This pre convention meeting or "Pre-Con" was an opportunity for us to give the hotel the final numbers for our buffet and banquet dinners. It was also an opportunity to meet the hotel staff; those people responsible for making sure each event happened as scheduled. Wednesday morning started with our getting the hospitality room and registration tables set up. Since we had so many more people register for the reunion, there was no question that the hospitality room would be a tight fit. For that reason, we set up the registration outside the hospitality room. We were all ready to go with snacks, cold soft drinks and beer on ice in time for our official opening at 12:00 noon. You only need to go to one reunion to realize that the Hospitality Room is what the reunion is all about. This is where you receive your registration envelopes, your nametags and event tickets. You can find assorted reunion souvenirs like coffee mugs and ball caps as well as a display of items donated by K&E Crafts, the company that made our coffee mugs. And, the hospitality room is where your friends will be spending most of their time. Check in started with each member signing the guest book and hotel registration log. Next, they received their registration envelope where we verified each event that they planned to participate in. We made certain that each person had the right tickets for each tour and meal. Each crew member then got a free coffee mug and souvenir as well as a chance to buy 50-50 tickets, raffle table tickets and of course get a USS Benjamin Stoddert 2005 Saint Louis Reunion Ball Cap. Registration continued on into the evening . At 7:00 PM the hotel staff showed up with several trays of cheese, chips, dips and of course some pretty tasty wine for those who enjoy it. Part of the contract for the reunion included a free wine and cheese reception for up to thirty people on Wednesday night. When we asked for this, we based the number of participants on how many responded to the survey. We missed the numbers by quite a bit since we had twice as many as we figured on. We ended up paying a few dollars for the extra people so everyone got to participate. Later that evening, a few folks headed out to see some of the local sights while most decided to spend the remainder of the evening in the hospitality room getting reacquainted. Our coach started boarding at 8:45 and at 9:00 most of the members were headed out to "Discover Saint Louis". 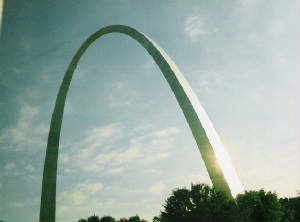 The six hour city highlights tour included a stop at the Gateway Arch for a tram ride to the top or a viewing of the movie "Monument to the Dream". Next we headed to Union Station for lunch at one of the many shops or restaurants. We negotiated the tour contract with lunch "On your own" in order to keep the prices down. After lunch we visited the incredible Basilica of Saint Louis with it's more than four million ceramic tiles. By 4:00 most of the crew was ready to head back to the hotel and the hospitality room. Dinner on Thursday was "on your own". 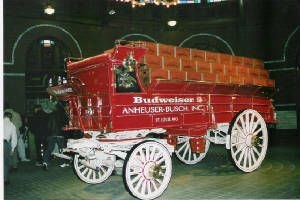 At 9:00 AM Friday we boarded our motor coach and headed out again, this time, to visit the famous Anheuser-Busch Brewery. 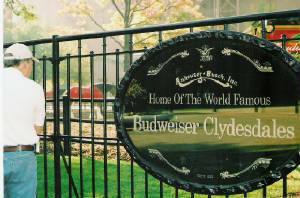 The only remaining American Owned Brewery, Anheuser-Busch provided a guided tour of the brewery including a final stop for samples in their lounge. With everyone well relaxed and refreshed, it was time to reboard our coach and head to the Missouri Botanical Gardens for lunch "on your own" and a tour of the gardens which are particularly beautiful in the fall. By 4:00 we were back at the hotel. After a short spell in the hospitality room to see who had arrived while we were out, it was time to get ready for the Friday buffet dinner. The buffet was held in one of the hotel banquet rooms. At 6:00 the bar opened and dinner started promptly at 7:00. There was plenty of good food and even some sea stories. Following a long day, most of the members were ready to turn in, but a check of the hospitality room at 2:00 AM revealed a few still steaming like they were 18 years old and on their first liberty. Saturday morning we took a break from the festivities in order to discuss our future. The members present agreed that we should form an Association and hold another reunion next year. 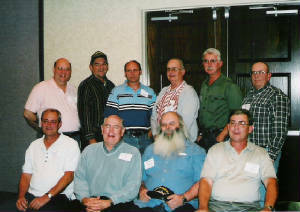 The membership agreed to use Military Reunions to Remember for the 2006 reunion. 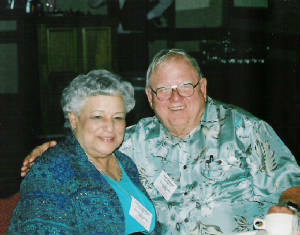 Mr. McManuels presented a proposal from the Sheraton Park Ridge Hotel in King of Prussia, PA and the members present agreed to have the next reunion there. Herm Chambers agreed to act as chairman for the 2006 reunion. Additional information and minutes from the business meeting can be found on page 4 of this newsletter. When we arrived at the hotel on Tuesday, Terry said everyone would be amazed at how fast the reunion will go. It seemed like we had just arrived at the hotel, then all of a sudden it was Saturday night and time for the banquet dinner. After dozens of letters, hundreds of email messages and more phone calls than you can possibly count, it was almost over. At 6:00 the bar opened just outside the banquet hall so that folks could relax with a drink and chat for a while. The doors opened at 6:45 so that everyone could find a seat prior to the opening ceremony. Hugh Fleet welcomed everyone to dinner and led the Pledge of Allegiance. Our chaplain Henry Koopman delivered the invocation followed by a moment of silence and remembrance. After everyone was seated, Herm made some personal comments and then invited everyone to join him for the 2005 Benjamin Stoddert banquet dinner. While the members enjoyed a fine meal, we held the 50-50 drawing. We awarded a total of $642.00 in cash prizes at the reunion. The first place prize of $321.00 went to William Christensen. The second place check for $192.60 went to Denny Dean. The third and final check went to Bert Cassels who promptly donated his winnings of $128.40 to the Association. Our other drawing on Saturday night was the raffle table drawing. We had ballcaps made by Eagle Crest and each person who purchased $20.00 in raffle tickets received one free. We had quite a few great prizes on the raffle table including free nights in the hotel. Space limitations prevent me from listing all the winners, but I would like to mention that we gave away a total of 4 free nights at the Crowne Plaza hotel plus 2 free nights at the 2006 hotel. After dinner came closing remarks and an explanation of the "Missing Comrade" table. Finally, music and dancing with our DeeJay from Music to Go.